Somewhere between the desire to expand cities under ambiguous visions of progress and urbanists’ rally cry for more walkable streets sits this unassuming checkerboard painted on a table. That’s right: Checkers (or something like it) can make your city better. 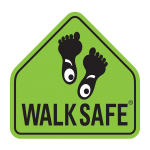 Thing is, with the increasing trendiness of both placemaking and walkability, it has become easy to duplicate popular ideas out of the Tactical Urbanist’s Guide2 and overlook the chapter on interactive ideas (especially those that are self-sustainable). For instance, if a pop-up parklet makes no further effort than to put AstroTurf and a few wooden benches in a parking spot, the only compelling reason to use the parklet is to sit down. That may be nice, but it is not necessarily captivating enough to create a noticeable difference. Given no palpable change in walkability, the status quo will probably want their parking space back, relegating the parklet to yet another chapter in the book of failed tactical urbanism that never actually made much of a culture change. Face it: A place can get old, quick. This is why the best walkable streets have an X factor in their placemaking efforts; something that subconsciously draws us in to the average sitting area, enticing us to relax and socialize. By capturing our imagination, the simple interactivity of sticky streets reminds us that re-prioritizing our cities towards human mobility – walking, utility cycling, and public transit – is a good thing. This term – coined by famed Vancouver urbanist and planner, Brent Toderian3 – describes a street or place with an inherently engaging quality. Time ceases to be a commodity on a sticky street; instead of saving time, you gladly spend time at one. Sticky streets are the real life equivalent to an engrossing smartphone app, without the slow loading times or eye strain. Which brings us back to that singular checkerboard table. One of our staff members discovered it at a local eatery over the weekend and promptly lost himself in a fiercely competitive game of strategy. The shop had also set up a beanbag toss and hook-and-ring target game in the same area, where a few families were busy enjoying these games of skill with their children. For the most part, everyone was spending as much time socializing with fellow diners as eating. With these extremely simple additions, these creative interventions had turned a mundane sitting area into a fun, public backyard. Applied to public space, this results in a sticky street – or sticky place – at its finest. Granted, some may dismiss the idea of checkers in public for fear of the pieces being stolen, but we’d like to think better of human nature than that (plus, what would anyone do with a box of huge checkers?). 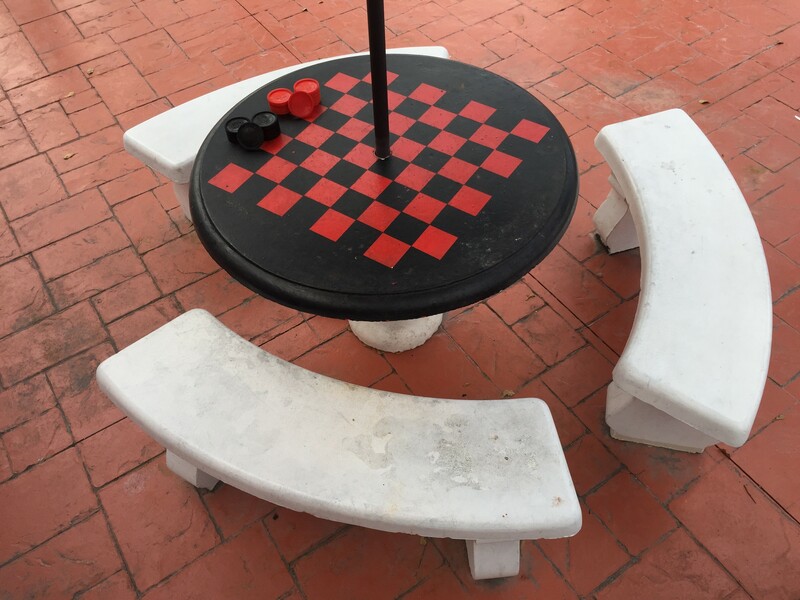 More importantly, a checkerboard embedded into every table in town is not the only interactive idea that can be implemented in a public space. It is just one of many creative examples of how a fundamentally simple nod to human psychology can create a more enjoyable, “stickier” place for people of all ages. These amusements may appear trivial on paper, but they are critical for turning a dead space into one that people wish to return to and enjoy – and thus essential for gaining future public support for pedestrian-oriented projects. By capturing our imagination, the simple interactivity of sticky streets reminds us that re-prioritizing our cities towards human mobility – walking, utility cycling, and public transit – is a good thing. Plus, there’s nothing like winning a game of checkers. Well, maybe Monopoly. But that’s another story.